Adjust the cooking rack to the bottom position and preheat your toaster oven to 300 degrees F.
Place the chocolate chips in a toaster-oven-safe ramekin. On a small baking sheet arrange the coconut and nuts in an even layer and add the ramekin to the pan. Heat in the toaster oven until the coconut and nuts are toasted, about 4 to 5 minutes. The chocolate chips will be shiny but still in chip form. Give them a stir and the chocolate will melt and become smooth. 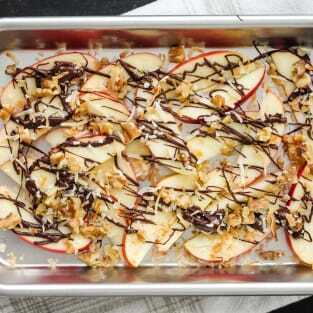 Cut the apple into wedges or slices and arrange on a plate. Drizzle melted chocolate over slices and top with coconut and nuts.